Radar the kitten here! Reportin for duty! Here’s the deal! Liana went to sleep, what a joke! Everybody knows that kittens sleep 22 hours a day yet somehow manage to continually find themselves underfood underfoot and climbing on stuff! Ha-ha! But I have been reformed! So I am pulling my weight (all 2½ pounds!) by helping out! It is pretty rad to be a kitten! So I scanned in these drawings Liana made of things that aren’t cat food! And here’s what they are! The thing here is the TERRIBLE Ro-Bat! O woe the Ro-Bat! It is sensitive to light on account of its multi creepoid compound eyes! 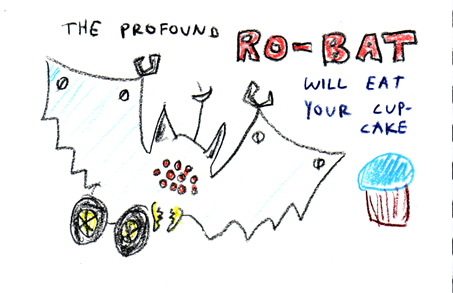 So the Ro-Bat wheels around looking for planets to ruin and despoil! Only to be blinded by the astrobulb on the helm of its lesser bipedal accomplice! While this is bad news for them! It’s good news for us! Means I am liable to get more of that gnarly cat food! You should try some! Here! Let me put some in your shoes! AWESOME! It is even cute because I am a kitten! P.S. — Here is a picture of me! Because the only thing cuter than a kitten is a kitten somebody is looking at on the internet!! I wonder if paperdolls dressed in totally over-the-top fifties-style cupcake dresses and aprons might be similar enough to get some of the benefits? I don’t eat cupcakes as often as I might like, but I do like flipping through my copy of VCTOTW and following Cupcakes Take The Cake… they’re just so cute, and often so inventive. 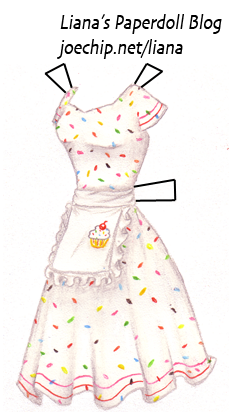 I like the way this turned out, with the little cupcake pocket on the apron, although I almost scrapped the sketch because the skirt wasn’t quite poofy enough… maybe next time. It’s probably really a stretch to tag this ‘historical,’ isn’t it?